Our Ancient Grain snacks come in four delicious Latin American inspired flavours: Sweet Chilli Salsa, Peruvian Pink Salt, Sea Salt & Cider Vinegar, Jalapeño and Cheddar Cheese. 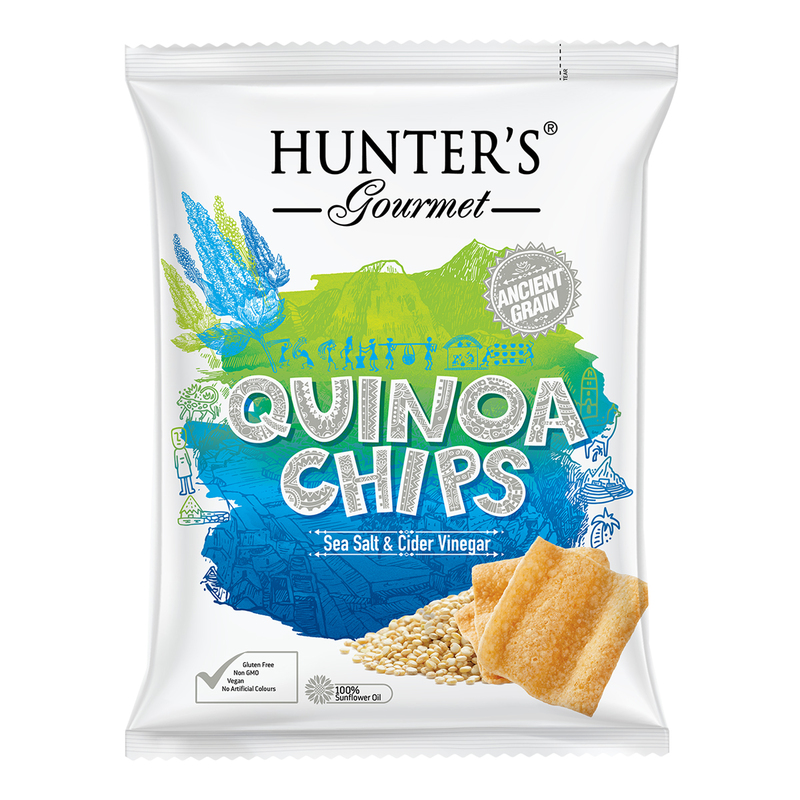 These wavy, harvest-golden Quinoa Chips are full of the goodness of the ancient grain, Quinoa, one of the superfoods that the Incas referred to as “Mother of All Grains”. The Jalapeño and Cheddar Cheese complement perfectly the wonderful natural flavor of the Quinoa Chips. Jalapeño adds a fantastic kick to this phenomenal chip while the roundness of the Cheddar Cheese flavour, to keep your mouth watering from the first bite to the last. In addition, these chips are completely gluten, MSG and GMO free and with no artificial colours! Another delightful addition to our Better for You range of wellness snacks! Hunter’s Gourmet Quinoa Chips – Jalapeño & Cheddar Cheese (75gm) 75gm Packet. Alternative Snacks, Gluten free, MSG Free, Non GMO, No Artificial Colours, No Trans Fat. Quinoa flour 28%, sunflower oil, potato starch, corn starch, corn flour, nature identical jalapeño & cheddar cheese flavour [whey powder, maltodextrin (corn), salt, flavouring (cheese, butter), dextrose, palm oil, milk protein, hydrolysed vegetable protein (maize), anti-caking agent (E551), onion powder, glucose syrup, sugar, acidity regulator (E330), yeast extract, butter powder (butter, maltodextrin (potatoes), milk proteins, emulsifier (E471), garlic powder, natural flavour (cheese), nature identical flavour (pepper),natural paprika colour (E160c)]. Contains: Milk Manufactured in a facility that stores and/or packs peanuts, tree nuts and products of gluten, dairy, soya, mustard and celery. “Lovely Flavour”. Nice combination of fiery taste of jalapeno and the yummy taste of cheese. Perfect Taste. Qualitatively Fresh and Yummy. I love the fact that its Gluten free and No Trans Fat. Thank You Team for this Quality Chips with yummy Flavour.